The Keeper's Blog: How Close did the Bear Actually Get? How Close did the Bear Actually Get? Pretty Close. What's happening to Black Bear's in the Smokey's? Well, their numbers are recovering in the National Parks and National Forests around my home town. We recently had a terrific time camping there with our family. We tent camp. It was loads of fun. We aren't those tourists that run after bears. Bear's are majestic in their natural habitat and we feel lucky and blessed to have seen them. But the encounters also left me wondering what would become of the bear. The park was crowded. Lots of people ran toward the bears we saw. While some seemed ok with this, this fellow seemed a bit stressed out to me. He was wandering around mid-day (something bears do when they get used to human food) just off the Loop Road in Cade's Cove while we were sitting in a line of traffic. 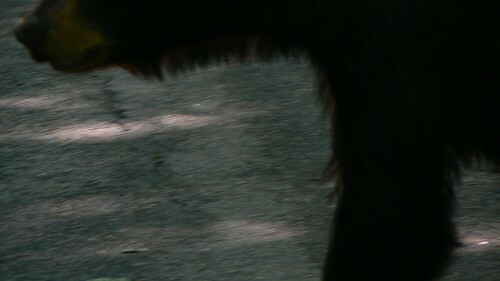 The first photo is the bear walking behind our car. The second is the bear approaching. A line of car's had stopped obviously to see the bear. Some tourists abandoned their autos and ran toward it. We happened to be in the direction that the bear ran to get away. He ran right into traffic. We saw three bears while touring the historic sites and mountain valley that is Cade's Cove. Cade's Cove is in the Smokey Mountains National Park In Tennessee. It's very crowded, but just as beautiful and special as I remember. The NPS is doing a remarkable job in this area of returning native species and blending cultural and natural resource management. Bear populations are rebounding although an attempt at re-introducing the wolf seems to have hit a snag. The park's new managment plan calls for bringing back native plants that may help rebuild the eco-system of small rodents and other small animals neccessary to support the food chain for other predators. The mountains once supported wolves and panthers. Native Americans hunted here and burned the fields periodically. Later Euro-american's (mostly the Scots-Irish who traveled to this area from Pennsylvania in the 1700's) settled and farmed. The open fields are filled with wildlife in the early morning and the loop is closed to vehicular traffic on Wednesday. You can tour by bike. We saw, three bear and maybe 16 deer, four wild turkey, a ground hog and a host of other critters during our Tuesday drive. Great fun. 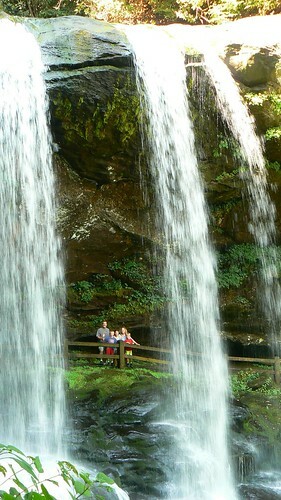 Another photo of Dry Falls on Hwy 28, on the Road to Highland's, NC shows one of many remarkable waterfalls in the Smokey Mountains. Incidentially, my home town is not too far away. I was born in Asheville, NC. My family (Some of those same Scots-Irish with a bit of French and English thrown in) lived in Pensacola, NC on the back side of Mount Mitchell, the highest point east of the Mississippi. Perhaps this is why, when I came to Florida, I became a lighthouse keeper. I have an affinity for high and remote places. One of our family names is McMahan. It is the Irish spelling of the Scottish clan name Matheson. Mahan is the "clan of the bear." Kathy-- I lived in Knoxville, Tenn. for eight years and even then (1968-74) we had problems with people harrassing the bears in the moutains. Of course, when someone got biten or slapped by a bear, the "victim" would demand the bear be shot even though it was the human breaking the rules!The Smokies are a favorite retreat of mine--hope to get back there soon.